Wow,love your menu idea.sure was delight for everyone. That's a super pack meal... Convey my hearty wish to ur lil one ! thats very delicious treat for everyone dear...Great menu ideas.. Awesome menu divya,sure everyone loved it..
that;s quite exhaustive... hats off!!! It all looks delicious! Happy Birthday to your son. Wat a spread sis, mindblowing menu and you have put of loads of efforts. That's a nice spread, happy b'day to your lil one..
Awsome dishes n u did a good job by posting dis in blog.this may help lots of ppl who r in confused taste like me...nice pic btw.. Thank u so much Divya for helping me workout my daughter's birthday menu..
Hi Shruthi, Advanced Birthday wishes to your daughter.A week before, I prepared the list of items I want to prepare for the party.Then I prepared the list of ingredients to buy for each ingredient and the container in which am going to serve the dishes. Then I started the preparations for the party dishes day before it self. Prepared doodh peda and kept it in a container. Prepared ginger garlic paste, chopping veggies etc. The night before the party, marinated the chicken for tandoori and kept it in fridge. Also prepared kheer and kept in fridge. The next day morning marinated chicken for biryani. Then I prepared Thayir Semiya and kept in fridge. Then prepared all the items. The last I prepared was pakoda,since I wanted to serve it hot for the guests. Though I prepared the dough before itself, just did the frying at last. A friend of mine helped me for that. It is very easy to do things with little planning and breaking up tasks on priority. Don't be shy to ask for help. You can easily prepare this and am sure your daughter's party will be a great hit. Hope this helps. In case if you have any other doubt you can mail me at blogadmin@divyasculinaryjourney.com. 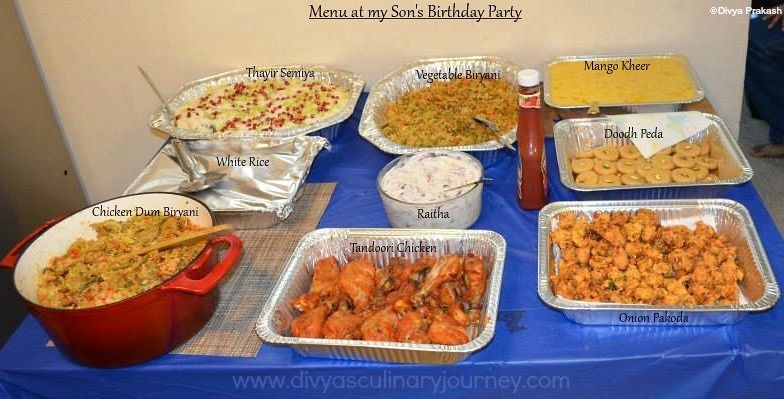 If you can, do share us your daughter's party menu and pictures of what u prepared. Take care. Happy Cooking!! what a delicious birthday buffet!